After the cooling off of IPOs since the dot com bubble, Google has rekindled the fire for IPOs. This IPO reader contains new articles exclusive to this reader by leading academics from around the world dealing with quantitative and qualitative analyses of this increasingly popular and important area of finance. Articles address new methods of IPO performance, international IPOs, IPO evaluation, IPO underwriting, evaluation and bookbuilding. Although numerous articles are technical in nature, with econometric and statistical models, particular attention has been directed towards the understanding and the applicability of the results as well as theoretical development in this area. 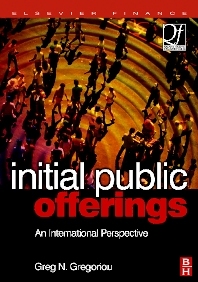 This reader will assist researchers, academics, and graduate students to further understand the latest research on IPOs.